Colonel Muammar Gaddafi got announced one of the first candidates to this year’s Nobel Peace Prize. Professor Henning Andfjorden, a member of the Nobel Prize Committee, while presenting the candidature of Gaddafi, stressed that the leader of Libya would strengthen his chances for getting the Nobel Peace Prize if, apart from admitting to shooting down the plane over Lockerbie, he confirmed that he had been the perpetrator of the remaining assassinations he was accused of. “It could help him and make the committee’s task easier,” said the professor. Referring to the polemical opinions in the case of the Nobel Peace Prize for Gaddafi Andfjorden used the example of Mikhail Gorbachev who got the Nobel Prize for breaking with the communist doctrine of world conquest instead of the militarist Raegan, who forced him to do it. The Libyan dictator commented on this statement during a press conference organized to celebrate the end of another stage of work on the secret Libyan atomic program which is blatant now. “I admitted to shooting down the plane and I made it clear that I had a hand in the blowing up of the disco La Belle in western Berlin. These two massacres should be enough. Just in case, I’ll admit to other assassins gradually the closer it gets to getting the award,” said Gaddafi. The ex-chairman of the European Committee, Romano Prodi, hearing the news about Gaddafi’s candidature called off all his meetings and booked a ticket for the soonest flight to Tripoli. “I must congratulate Muammar in person. I have also talked to Gordon and Angela, who also intend to go to Libya. A nice meeting may take place. I only hope that Gaddafi will not shoot to the plane I’m going to fly in,” Prodi joked at the end. 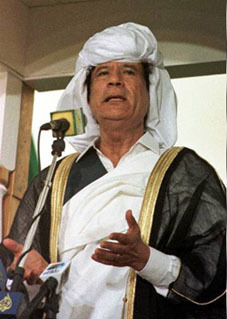 Muammar Gaddafi stated that once he gets the prize he’ll allocate the money for building a monument of terrorism victims. “I would like it to be a living monument in the form of my winter residence in Baden Baden where I’ll invite my European friends who fought terrorism so wonderfully defending these innocent people I have on my conscience. I’m already happy thinking of their exemplary thanks.” Gaddafi finished. So far nobody has been able to point at the place where the two planes passed by one another exactly. Airlines have put a padlock on their mouth and they give no information. No sources give any information if the crew or passengers of both aircrafts have been interrogated about this case either.